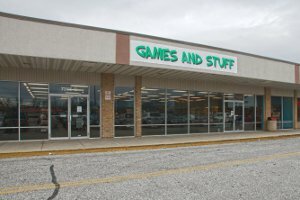 Games & Stuff has moved to the Cromwell Shopping Center (about 0.5 miles from the previous location). From I-97, take Exit 16 (MD 648, Baltimore Annapolis BLVD). Turn left onto MD 648. The shopping center is about 0.3 miles from the exit, on the left. Sessions are on the 2nd and 4th Tuesday of every month from 5 PM - 9 PM.